I am pretty health conscious, especially when it comes to what my family eats, but treats are not banned, and candy has a special place in my heart. 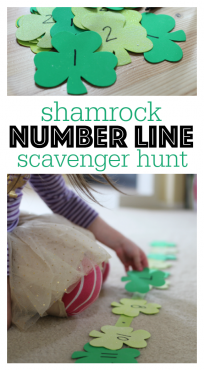 When my son and I made both the St. Patrick’s Day treats in this post, he turned up his nose at the sugary one and gobbled up two spinach and banana popsicles in a row! 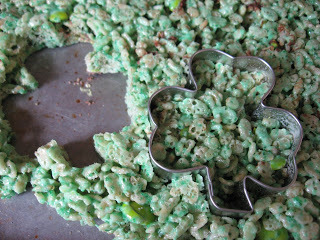 I was proud, and it made up for all the marshmallows he ate while we were making the shamrocks. You can’t win every time, right? Gather your materials. 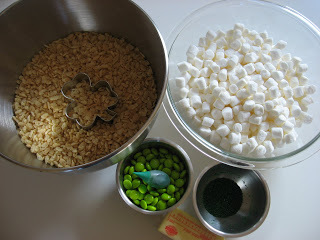 You will need 5 1/2 cups of marshmallows, 5 1/2 cups of rice crispy type cereal, 1/4 cup of butter, green sprinkles, green candies, some nonstick spray, a large sauce pan, two baking sheets and a shamrock cookie cutter. * I had food coloring out but didn’t end up using it; the sparkles bled enough. 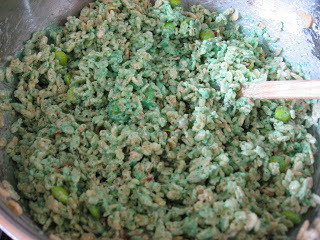 Stir the green sparkles and candies into the cereal. Add the marshmallows to the melted butter and stir until smooth. Let cool in your fridge for an hour. Cut out with a cookie cutter and enjoy. 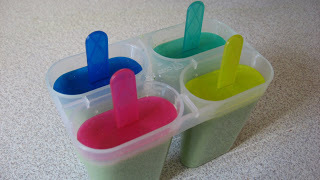 These are my son’s favorite smoothies (ooobies) poured into a popsicle mold, making St. Patrick’s Day treats. Gather your materials. 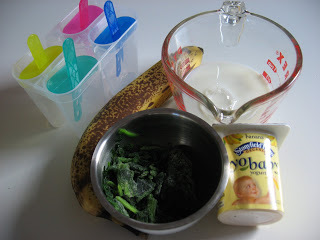 You will need a blender, banana or vanilla yogurt, some milk, frozen spinach, a very ripe banana and popsicle molds. 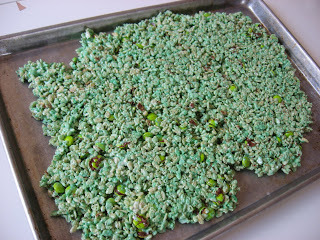 Pour into the mold and freeze for at least 3 hours. Pop out and then enjoy! Fantastic colours! 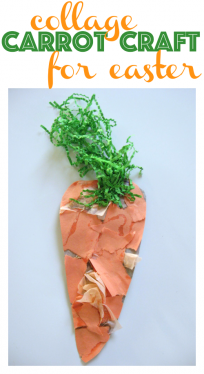 They look fun to make. I’m totally go to make those pops! Toni – I use about a handfull, so maybe a little less than 1/4 cup. So I gave you a bloggy award since I love your site so much! These are such great ideas! I love the smoothie popcycle idea. Wonderful! 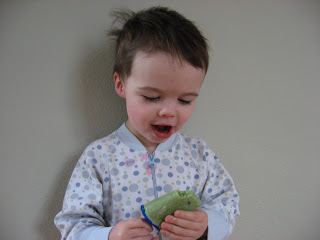 I am totally trying the spinach banana pops. My LO’s love anything frozen and they love bananas…I might have to wait until summer though so they can eat them outside or eat them in the bathtub. LOL! LOVE your site, thanks for all the wonderful ideas!!!! 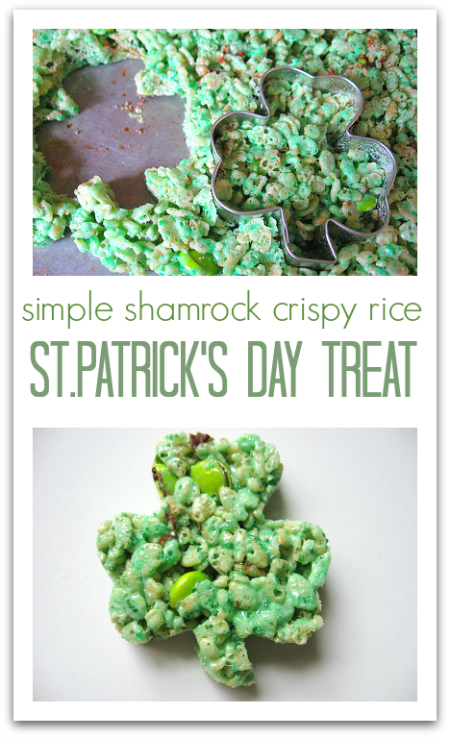 What a great idea for St. Patty treats! I am also happy to hear your son loved the popsicles. I am going to have to try these! Great idea on the smoothie pops! I can’t wait to try them. I’ve seen spinach in smoothies and juicers before, but I’m scared. It scares me! I need to get the courage to try it. And I love spinach, just the thought of eating this- I don’t know what it is????? I think I should def try it, especially on the kids! Great idea. I’m the type that kind of stresses out if I don’t have the exact recipe. Sad, I know. Could you share how much milk, spinach, and yogurt you use? Thanks! Kelly – it’s not sad at all I measured ours today for you. – if your banana isn’t that ripe you may want to add a little sugar or vanilla. Or use vanilla flavored milk to hide the spinach. 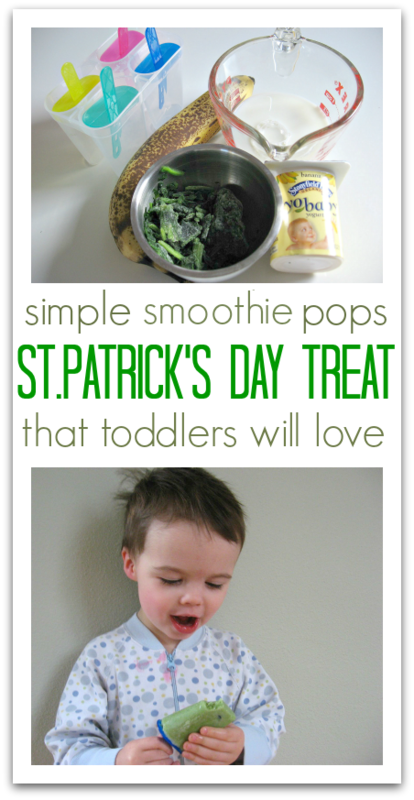 Hope that helps, my son loves these and this recipe makes 1 smoothie ( a full take and toss cup) and 4 small pops. 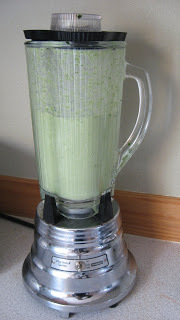 I was making a “raw” green drink for my daughter for a bit that involved fresh baby spinach. In a blender I mixed up a handful of baby spinach, 1-2 peeled apples, ~1/2 cup apple juice to thin it and a handful of ice cubes. I was surprised she drank it but she did. You could also throw in a frozen banana but my kid doesn’t like the taste of bananas so I don’t. Love your site! Thanks for all the great ideas. Lisa — I am going to try that tomorrow, thanks! Have you ever made them with fresh spinach? We always have fresh spinach on hand. I want to try them this week. They look yummy! I haven’t but the frozen stuff isn’t cooked so I doubt it would be that different, it may be a bit more bitter, but nothing a little sugar can’t hide! I tried it today! I used fresh baby spinach, but I steamed it a bit to make it limp. And I omitted the milk (mostly an oversight on my part!) My 5 year old LOVED it, and he won’t eat spinach plain. Thanks! .-= Kacie´s last blog ..Getting to Know ME! (Some More) =-. 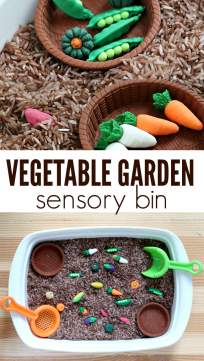 I would try it with breastmilk or formula – why not?